If you’ve been in the audience when I speak or train, you know I love a question-asking-question-answering-all-in-engaged audience. And one of the ways that I “reward” people for their participation is to give away socks—they’re brightly colored, polka-dotted, cozy and high quality. Since I can’t give you socks today, I thought I’d share some of the homework and treats from that presentation, titled Out Care the Competition: How to Use the Power of Brand and Client Experience to Differentiate Your Firm. AP Stylebook Cheat SheetI’m a fan of consistency in all things related, including words and punctuation. A clear set of rules makes all the difference. (Not unlike an Investment Policy Statement.) Professional writers and journalists use a style guide that outlines the “rules” about grammar, punctuation and more. I’ve grown up using the AP Stylebook, which contains the nit-pickiest writing and punctuation rules you’ll ever need to know. No need for that book just yet. To help you get started, I’ve created an AP Stylebook Cheat Sheet. Use it to put the final touches on your RFP responses or pitch book. As an example, are you consistent with your use of serial commas? What about setting numbers, such as “ten” or “10”? If something is worth doing, it is worth doing intentionally. Even the quality of paper you select for your business cards matters. (What does a wimpy business card say about your organization?) Early in my career I was a graphic designer. I always knew that the feeling of paper mattered, I just didn’t have a scientific reason why. And then, when researching material for my client experience seminar, I found some very interesting work on the neuroscience of touch. Finally, I love a good hack. To get you off to a good start for 2018 and beyond, I’ve created My Favorite Things, a short list of resources to help you hack your visual brand. In it I list some of my favorite marketing resources, such as Canva and iStock, just for starters. Here’s to a lovely December. And here’s to celebrating National Sock Day wherever you are. Starbucks didn’t create the coffee culture; there were plenty of places to get a cup of coffee before they started. What they did was turn a once-upon-a-time purchase into a daily ritual for many of us. (Short Flat White anyone?) When Howard Shultz bought the Seattle-based firm, he shifted our idea of what coffee could be. No longer simply slopped into a cold white cup as an afterthought; its preparation was handled with craftsmanship and care, the star of the show. Now, those drinks with the fancy Italian-sounding names – once thought to be available to the rich, famous and educated – were available down the street. When speaking about the world of branding and client experience, I often use the Starbucks example of moving from a commodity to an experience. They welcome you into a hip “third place” – sometimes knowing your drink as you walk in – usually with a hand-selected play list in the background, greeting you with a scripted request, “What can I get started for you today?” It is evident Starbucks thinks about every inch of your journey. And, you’ve likely seen that happen in other industries – computer retailers, book sellers, shoe peddlers and theme parks come to mind. Even banks understand the significant and value of focusing on client experience. Have you considered your client’s experience? Have you mapped their client journey? What do they experience the moment they engage with you? As you plan for 2018, my recommendation is that you begin to map that experience. What about having your phone number on the front page of your website, rather than behind a Contact Us button? How does your inbound voicemail message sound? Do you help them beyond their financial lives? While compliance can be a hindrance for some marketing efforts, many of these “wow”able moments can happen outside of the compliance bubble. Need inspiration? Look outside of financial services. Pay attention to your own customer experience. Look for an extra special interaction. They are often tiny and might even seem inconsequential until you see how they add up to create a unique connection. Need even more inspiration? 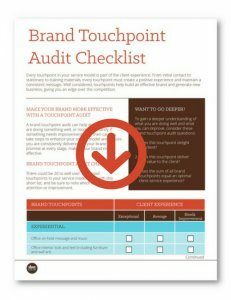 Download my Brand Touchpoint Audit Checklist. Recently ERISA attorney Ary Rosenbaum wrote a great post, Marketing For Plan Providers: What It Can Do And What It Can’t. In the article he mentions a variety of not-marketing tasks and tactics that every business must consider before marketing. These include ideas such as finding a target market, creating a company culture, providing an exceptional client experience and more. And! I agree wholeheartedly with the ideas he outlines with one exception: EVERYTHING is marketing. Well, let me explain. Recently, I presented a two-day Deconstructing Digital workshop for a group of advisors at Cetera. Yes, two full days of helping them get their arms around the world of digital marketing and social media. And, I’m certain they were expecting we’d start the first day with a predictable PowerPoint presentation about Facebook or Twitter or LinkedIn. Nope! In fact, the first full day was discussing everything that Ary points out in his article (as not marketing). And, you know what? He’s right. It isn’t marketing; it is branding. But they are two peas in the same pod. • We discussed the necessity of a heart-centered message. • We dove into the courage it takes to serve a niche. • We explored the experiential economy and how customer service links to client experience. If brand clarity does not exist at the outset, marketing will not succeed. It will simply be noise—and noise gets you nowhere. If brand clarity does not exist at the outset, marketing will not succeed. I say this to many advisors and organizations who seek my help: Branding must begin with asking yourself, “What do I want to be when I grow up?” Deciding this, and having the courage to see it through is a deeply introspective and soul-searching experience. Great branding starts with your customer’s story—not your own. It appeals to their heart rather than their head. It makes people feel like they belong. It gives them something to believe in. Out of this work comes creating your marketing strategy and tactics to find the right people; creating and delivering the right message; and developing solutions that serve them in the right way. Marketing’s role is to help an organization connect to people in an emotional way to build influence, elicit trust and serve sales. Marketing is pretty much everything. If you’d like to get a list of the homework I give folks to help them think through their brand and marketing strategies, simply text the word SHOEFITTS to 33444. I’ll send along some treats and inspiration from my presentation Your Brand, Your Business, Your Bottom Line. One other tip: How did I know Ary mentioned me in his story? Google Alerts, of course. I have one set for my name and my firm name, in addition to other hot topics. Need help on creating your own “listening channel”? Here’s a helpful article I wrote for NAPA-net.